Doctors voiced concerns that the European Digital University could be serving as a back door to work in EU hospitals. 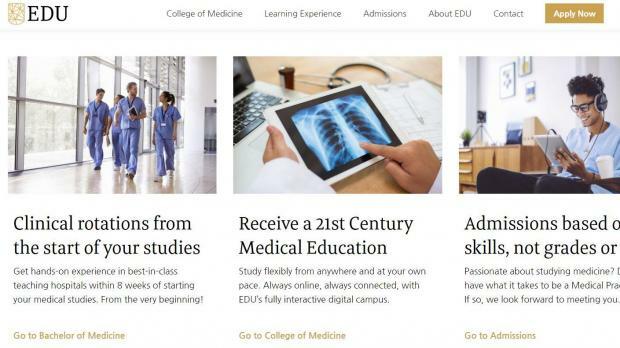 Concerns over a Malta-based online medical school were flagged during a recent meeting between Education Minister Evarist Bartolo and the doctors’ lobby, the Times of Malta has learnt. Sources said the Medical Association of Malta requested the meeting to voice concerns this could be serving as a back door for doctors with questionable qualifications to work in EU hospitals. It could also pose a risk to the island’s reputation as a centre of excellence in medical training, the doctors’ representatives told Mr Bartolo. “This is a matter of concern for us because we want to ensure Malta retains its good international standing as a centre of learning,” Martin Balzan, president of the doctors’ union, said. Frank Montgomery, who chairs the Standing Committee of European Doctors, said last week the medical courses via online correspondence had been the topic of discussion at a recent members’ meeting. The German doctors’ lobby has expressed worries about the private medical school its operations. The European Digital University, which runs the online medical school, took umbrage at what Prof. Montgomery said on the matter. In a ‘right of reply’ (see below), it said his comments “unfortunately” cast doubts on the credibility and seriousness of the quality and reliability of the Maltese accreditation system. The EDU was licensed by the Maltese education authorities last year. Its website says that “the innovative EDU study model provides the best possible education in clinical medicine to young people with an intrinsic passion for becoming a physician”. Mr Bartolo told this newspaper the authorities were being “very rigorous” in reviewing the company’s requests to certify physicians. While the government was all for innovation, it was also aware that medical education had to be treated sensitively, he said. All EDU quality standards adhered to the guidelines of the National Commission for Further and Higher Education and were, therefore, based on the European quality standards, Holm Keller, director of the Kalkara-based Digital Education Holdings Ltd, insisted. “The main thrust of the article ‘Fears over online “medical school” in Malta’ (January 24) was that of putting forward the views of Frank Montgomery on whose opinion the article is effectively solely based. “These views, in essence, unfortunately cast doubts on the credibility and seriousness of the quality and reliability of the Maltese accreditation system. They are also inexplicably dismissive of the method of regulation of innovative digital developments in this sector. “It is to be noted that while Prof. Montgomery seeks to cast such doubts, he does not make any comment of the standing and reputation of the private German hospitals that provide the practical training as an integral part of the courses offered by the European Digital University. “In putting forward Prof. Montgomery’s views, the article in question states, with reference to the European Digital University, that ‘He said he was informed the company had only decided to come to Malta as it had been informed it would be given the go-ahead by the authorities in a relatively short period of time’. Nothing could be further from the truth. “The identification of Malta as an ideal hub for the development of digital technology, with a particular emphasis on the health and medical sphere, dates back to 2012. This is when the promoters of the EDU decided to come to Malta and this was done on the basis of Malta’s publicly-stated pledge and commitment of setting the island as a centre of excellence in research and technological innovation. The choice of Malta was, in fact, solely and exclusively brought about since Malta was the first member State to implement and transpose the EU directive on digital universities into national law and to mandate a national body accordingly. “The article goes on to state that ‘Clearance, he remarked, was given in less than two months, again raising concerns of the level of due diligence’. “Yet again, this assertion is completely untrue and grossly misleading. “The presentation of the application was the final stage of years of planning and presentation that were the subject of detailed and highly-stringent verification and consideration. Far from having been concluded in ‘…less than two months’, the actual accreditation process for the provider and programme accreditation of the Bachelor of Medicine course started on June 21, 2017 and lasted until June 5, 2018. “The National Commission for Further and Higher Education licensed the EDU as an institution of higher education on June 5, 2018. As a higher education institution, the EDU is licensed to deliver programmes classified from Level 5 up to Level 6 of the Malta Qualifications Framework, providing that these programmes have been formally recognised and/or accredited by the National Commission for Further and Higher Education. “The Master of Medicine programme, which will lead to a degree as a medical doctor, is currently in review according to the accreditation process of the NCFHE. “Detailed CVs and publication lists have been provided to NCFHE and a full list of medical teachers can be found on the EDU website online. The medical faculty comprises highly-recognised academic staff from around the globe.